Recent GELF research unveiled at GELF LA ’16 confirms that international shipping remains the top cross-border ecommerce fulfillment model. Executives we interviewed confirmed that 1) reducing the cost of international shipping and 2) providing more transparency throughout the order fulfillment process are two ways that ecommerce brands are improving the cross-border shopping experience. The GELF Research Program for 2016 has included a series of studies exploring the key drivers improving cross-border (XB) shopping experiences. Our focus in ‘16 as been on how leaders have been prioritizing and tackling international shipping challenges. Our recent study was sponsored by Yakit and we’ve released the key findings in our first GELF white paper. We encourage you to download the white paper at Yakit’s site! Or check it out in GELF’s downloads sections. At GELF LA’ 16 we reviewed our latest research findings and our panel provided executive insights and key take-aways. Anthony Khedaywi, CEO of Indestructible Dog, provided the “high velocity” ecommerce start-up POV while Alex Golshan, whose clients include American Apparel and BCBG, weighed in from the large retailer perspective. Jaggi Ayyangar, CEO of Yakit, provided “flat world commerce” insights about how international shipping software and innovation is offering small and large ecommerce brands opportunities to boost conversion rates and reduce customer service costs. 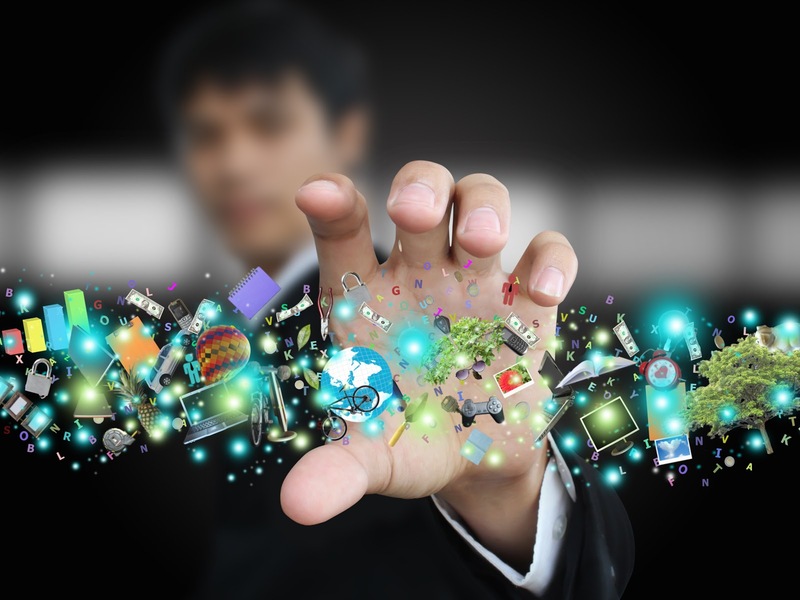 Who are the new players in international ecommerce? We see more and more new ecommerce brands that are built from the ground up to pursue international ecommerce opportunities. These tech savvy online retailers and brands selling direct-to-consumer (D2C) prioritize speed to market and obsess about an improved customer experience. Interviews supporting a Q1 ’16 study led us to call them “Local Heroes” and Jaggi’s team has now introduced us to the “high velocity” moniker. These ecommerce companies are often niche, “specialty within specialty” retailers selling exclusive assortments (often global “top sellers” from a niche category) and unique, long tail products. From a product category perspective, branded specialty apparel/fashion lead with health/beauty following. No surprise here since these are the top two cross-border ecommerce categories. What can we learn from these high velocity brands? Their priority from pre-launch is making sure the cross-border shopping experience isn’t plagued by many of the hiccups that are often characteristic of XB Passive Selling Phase – lack of country currency options, poor communication of policies for cross-border shoppers, awkward and unrewarding site navigation, just to name a few issues. In the GELF framework below, we’ve highlighted the three phases of international ecommerce expansion – Passive, Growth and Build. 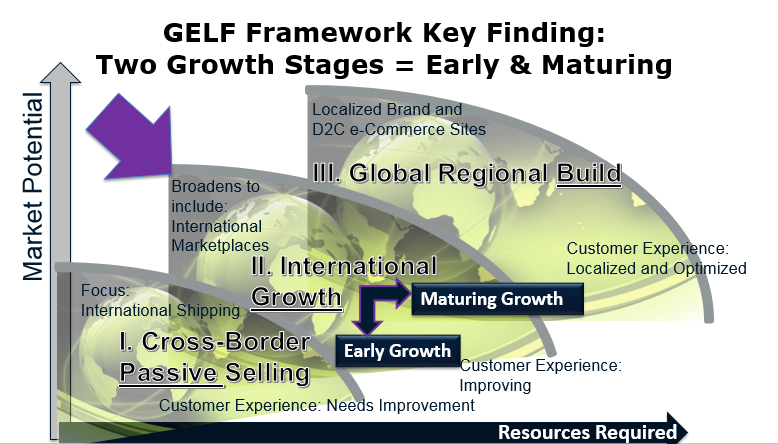 The updated GELF Framework above – which introduces two stages in the International Growth Phase, Early and Maturing Growth – is detailed in another post (see Raising the Bar). Many “high velocity” ecommerce brands work with compaines like Yakit to skip straight to the Growth Phase. 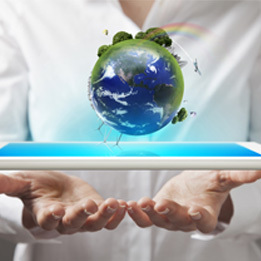 They realize that international ecommerce success requires planning beyond simply fulfilling organic demand. These ecommerce entrepreneurs tailor sites to understand the origins of an international customer and present clear communications about what can and cannot be shipped overseas. Often they have rich stories to share about the products they are selling. So content is key, especially content that includes social cues and input from their community. This focus on content-driven storytelling engages international shoppers and helps with native demand generation and international customer acquisition. Fulfilling this new demand (while also staying true to their commitment to an engaging cross-border experience) also requires more efficient, more innovative supply operations – including drop shipping. Check out the white paper for more details about high velocity ecommerce sellers are taking cross-border to the next level. The GELF LA panel also explored the growing importance of international marketplaces as retailers broaden their focus from Passive Selling to the International Growth Phase. We discussed what a marketplace looks like today and agreed that the concepts are evolving. No longer are international marketplaces “just your father’s marketplace” (e.g., Amazon, Tmall or eBay) or the early “buy from any U.S. retailer” flavor of XB marketplaces offered by consolidation models or forwarders (e.g., MyUS, Int’l Checkout). Instead the panel discussed how they are also exploring more niche international marketplaces that are coming online. As these aggregation plays emerge some are describing them as marketplaces differentiated by “a curated influencer layer.” We are also seeing more social elements in this marketplaces that go viral and attract specialized audiences drawn both to unique, niche products and the fair trade philosophies and sensibilities of the sellers. Interestingly, our research found that many of the smaller online retailers are still in the exploration phase of international marketplace selling. Like larger brands that used to shy away from traditional marketplaces, high velocity and other online merchants are trying to work around some of the biggest marketplace challenges, namely not owning the customer” (e.g., not having access to data about the customer transaction) and not being able to control the experience. One area we do find emerging consensus, especially among high velocity ecommerce brands, is the embrace of DDP (e.g., cross-border products delivered duties pre-paid) as a way to improve the cross-border shipping experience. This is another topic that we cover more in depth in the white paper (which is available in the GELF Resources tab’s Downloads section or at Yakit’s site). 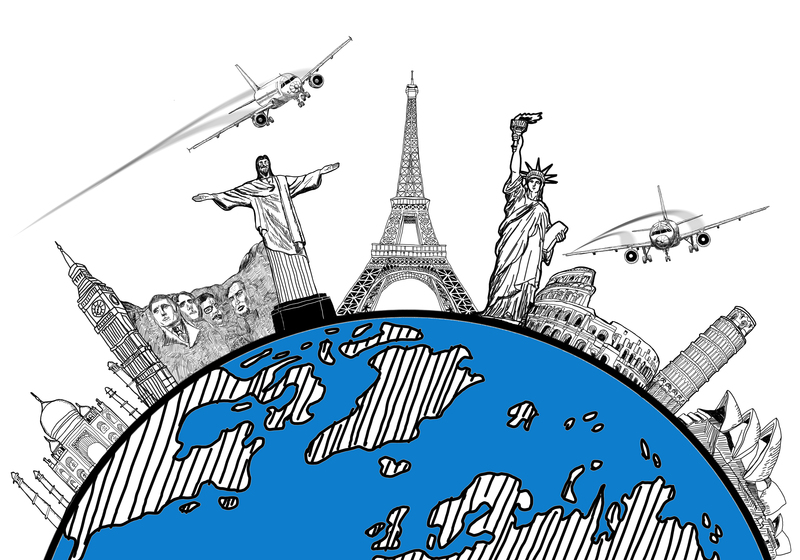 We still find that overall opinions regarding shipping internationally via DDP or DDU (e.g., duties due upon arrival of the order) remain mixed based on product type, destination, AOV and brand/ customer experience dynamics. However, as ecommerce leaders increasingly take ownership of global ecommerce operations, we are seeing more and more online retail brands embrace DDP as the preferred option for cross-border commerce. This commitment to DDP as the first and foremost way to improve the cross-border shopping experience is especially strong among leaders in the luxury and fashion/apparel sectors as well as newer/tech savvy digital sellers and global brands. Those that prefer DDU remain the risk-taking consumers (especially in China) that are willing to gamble that they can get product through customs without playing duties. Our research also finds that de minimis levels influence the decision. For instance, DDU is popular in Australia because shipments under 1000 dollars are duty free. It’s the Shipping Costs, Stupid! Our research validates that as the global middle class shops more and more via online channels and mobile devices, consumers are seeking (if not yet expecting) cheaper international shipping. We are already seeing demand grow for deferred service options, especially among newer shoppers that will wait longer to receive packages in order to save money on international shipping. A growing number find that their local postal services are not always reliable and that express shipping is often too expensive. The panel also explored if free international shipping is on the horizon. During the audit phase of our 2016 research program, we found some instances of free shipping for cross-border customers, but it was the exception (we saw mostly >$99 free shipping offers). The panel discussed that their industry colleagues are exploring free-shipping but that for now most are testing and learning, primarily by re-allocating shipping costs into product prices. Others are exploring flat rate shipping thresholds based on order value. Lastly, the panel discussed the importance of assuring international customers about the status and whereabouts of their international orders. We spoke about how preventing the customer from worrying about when their cross-border shipment will arrive helps the bottom line – by lowering customer service calls and keeping service staff focused on orders to come. Our research this year has found that demand for order tracking is growing as more retailers see providing order visibility as closely tied to the improving the cross-border customer experience. Thanks again to the panel at GELF LA for sharing their perspectives and executive insights. There is a lot more insights and quotes in the white paper so check out it here.